Act #98: Tell a girl she can be good at math. My mother is one of those people whose checkbook is balanced to the penny. Since the decline of my dad's health in 2006, she has single-handedly managed all of their complex finances and medical bills. Now fully retired to care for my dad, she has had a colorful and widely varied career path. She began as an executive assistant for a corporate CEO but moved quickly into office manager and bookkeeper roles, where she often oversaw the financial management of entire companies. She has owned small businesses, and right before the Asian stock market took a dive in the early 90's, she served as vice president of sales for an international manufacturer. For the last ten or so years she was a fierce card dealer in Las Vegas. Yes, you heard that right. My sweet, little mama lived in Vegas and dealt poker. Now she wasn't just your average card dealer. She was the type that big name casino managers sought after and secretly recruited because of her capacity to make her customers smile (even if they had just lost their last penny) and her crazy ability to count all the various combinations of cards and chips with remarkable accuracy and speed. I'm telling you all of this because I think it will bewilder you immensely (like it did me), when just this week my mother declared to me, "I've never been good at math." Come again, mother? Did you just say you've never been good at math? So I spent a good ten minutes illustrating to her just how "good at math" she has been and continues to be. I walked her through her entire career and for a moment, she seemed to be reflecting on her life span and finally said, "Maybe you're right. Maybe I am good at math." It would take this woman 62 years to overcome decades of self-doubt, years of ill-informed messaging drilled into her grade-school psyche - that girls simply aren't good at math. An illustrious 40-year career, primarily involving accounting and other practical applications of math, wouldn't even be enough to give her the well-deserved confidence and self-esteem to overcome those deep, constantly reinforced notions. 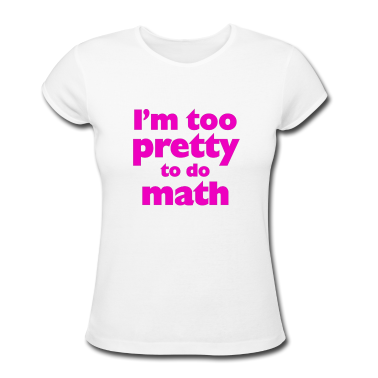 Please, don't wait 62 years to tell your daughter, niece, sister, or mentee that she can/is good at math. Just imagine what she might accomplish if she had the skills and she believed in herself.